P rince Caspian: The Return to Narnia is a children’s fantasy novel written by Clive Staples Lewis (more commonly known as C.S. Lewis) and illustrated by Pauline Baynes. It takes place in 1941, during the Second World War. The first edition was published in London, England by Geoffrey Bles in 1951. The Ryerson Children’s Literature Archive’s copy, however, is the sixth edition, published by the same company in 1966. The critical approach I will be taking for this exhibit focuses on the theme of escapism in Prince Caspian: The Return to Narnia. Specifically, I shall address how Lewis uses fantasy literature to appropriate the Second World War for child readers, who would have both experienced the war and dealt with the aftereffects. Prince Caspian: The Return to Narnia is a fictional novel written by C. S. Lewis. It is the sequel to the book, The Lion the Witch and the Wardrobe. A year has passed since the Pevensie siblings have returned to England after having ruled Narnia as Kings and Queens respectively. In Narnia, however, over a thousand years have passed since the children’s departure. A foreign people called the Telmarines have since invaded and have driven the Narnians into the wilderness; reducing them to nothing more than memories and myths. Prince Caspian X, the titular character, is the rightful heir to the throne. His uncle, King Miraz, took sovereignty by assassinating Caspian’s father, Caspian IX, and kept Caspian X alive until his heir was born. Sensing the danger, Caspian flees the palace into the woods, where he calls for help through Susan’s magical horn. This summons the Pevensie children to Narnia. Together the former Kings, Queens, Narnians, Aslan himself, and all their allies fight to regain the throne and restore balance in Narnia. The Second World War was fought between the Axis powers (Germany, Italy, and Japan) and the Allied powers (Britain, The Soviet Union, and the United States). This war was a continuation of the First World War, and occurred, in part, due to the heavy demands placed on Germany in the Treaty of Versailles (Wright). Adolf Hitler, who rose to power before the beginning of the Second World War, had a dream of the unification of Germany and the survival of the Aryan race whom he saw as superior. To ensure the survival of the Aryans, Hitler felt that certain actions were necessary. The primary objective was to occupy and populate Soviet territory. Hitler did this because he believed that more land would ensure the survival of the German population. This objective was called the Lebensraum (Lyons 47). Second, for the Aryan race to survive, all other inferior “bloods” must be eliminated. These included the handicapped, homosexuals, political opponents, and, predominantly, the Jews (Lyons 47). Hitler’s anti-Semitic sentiments were an ideology that preexisted within European society since the First World War. As minorities, the Jews were blamed for the defeat of Germany. In the Holocaust, millions of Jews perished under the ideology that they were inferior and degenerate people. Prior to the Second World War, an evacuation program was set up in Britain that was planned as early as 1938 and put into motion in 1939. Those of first priority during the evacuation process where children ages 1-15, according to Carlson Jackson who studied the British Evacuation Program. Of that group, those ages 5-15 were classified as Category A, the easiest to evacuate, and accounted for about 20 percent of all evacuated children. These children were evacuated in mass groups through their schools. It is particularly important to note that those children are the ones who would have the greatest recollection of the ordeal, and the Pevensie children fall under this category. By doing this, Lewis allowed his readers to connect to his characters and face the same hardships as they did. By eliminating those who posses knowledge of these people (such as the Old Nurse), Miraz makes these creatures nothing more than myth. Therefore, Miraz become an appropriation of Hitler and the Narnians an appropriation of the Jews. In this way, the mass death and destruction of a race is toned down for children who may not fully understand the situation, but should know of it in some form. Caspian’s initial meeting with Nikabrik, Trufflehunter, and Trumpkin parallels the situation of British evacuees. Caspian, who was forced to flee for his life, crosses paths with three different individuals. Each represent the three different types of reception that British Children received from their host families. Trufflehunter, the badger, welcomes Caspian with open arms and represents the families who were kind and welcoming to the children they took in. Nikabrik is hostile towards Caspian and represents the families who felt the burden of having another mouth to feed. This interaction represents the children who experienced terrible conditions during their evacuations. Trumpkin, on the other hand, is somewhat indifferent towards Caspian. He represents those who took in children out of duty, but did nothing more than what was required of them. Lewis, aware of how children were greeted by their host families, understood that each situation was unique, but that each situation a child faced during their evacuation generally fell into one of these three categories. By adding in these three characters and their ongoing conflict with accepting Caspian, Lewis identifies the hardships of fitting into another family and finding one’s place after being uprooted. Lewis again appropriates the war and gives his child readers identifiable and relatable situations. Escapism is defined as looking for enjoyable things to divert or distract one from thinking about their realities (“Escapism”). In the 1940’s, many children felt lost and out of place. Lewis therefore used fantasy realism as an appropriate way of taking real situations and making them easier to understand, by making it appealing and less devastating for children. In this novel, Caspian represents the children who were recently evacuated while the Pevensie children represent those already evacuated. For the Pevensie children, their return to Narnia represents the urge to retreat to a place of comfort, familiarity, and refuge. Narnia is a place where they have agency. In the real world, a child has no control over anything. They have no control over the war, where they are sent, who they will stay with, or those who they will live with. However, Narnia is a place where the child rules. It is the child that has the power, not only to make decisions that affect their surroundings, but that affect them directly. At various points in the novel, Lewis mentions how Narnia changes people by giving and promoting agency. 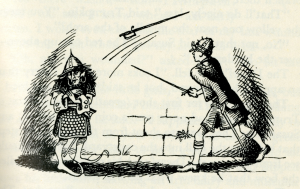 When Edmund was battling Trumpkin, he gradually began to regain his swordsmanship and skill. Lewis wrote, “But the air of Narnia had been working upon him ever since they arrived on the island, and all his old battles came back to him, and his arms and fingers remembered their old skill. He was King Edmund once more” (Lewis 94). It is the land itself that changes Edmund and restores his former skill. The longer he stays, the more he becomes who he once was and wants to be. He changes from a child to a King. Edmund’s case is not the only one where Narnia promotes the childrens’ agencies. Peter becomes more like High King Peter when he challenges Miraz to single combat (155-56). His eloquently dictated letter shows that he wields his pen like a sword and is as powerful as any adult in this land, though he is merely a child. In each of these instances, Lewis places the children in situations that allow them to enforce their own strength and power. The Pevensie children who have already grown up and became capable adults in this magical land, gain the ability to grasp that same agency upon their return. It is one’s agency that allows the children to escape their unhappy reality. Above all, Narnia allows the children to understand the stakes of war. The war that they are fighting in Narnia is a reflection of the war being fought in the real world. As former Kings and Queens, the children realize that if they lose, the Narnians will not survive. This parallels the situation in Europe, for if the British and the Allies lose, the Jewish people will be eradicated. However, while the Pevensies can do nothing about the situation in Europe, they have active roles in Narnia where they have the power to save the Narnians. As Donald E. Glover states, stories are powerful because they are able to blur the lines between reality and fantasy (78-79). If anything can be said about Lewis, it is that he held a special place in his heart for his child readers. Hundreds of letters written in his own hand were sent to children in reply to their enthusiasm. 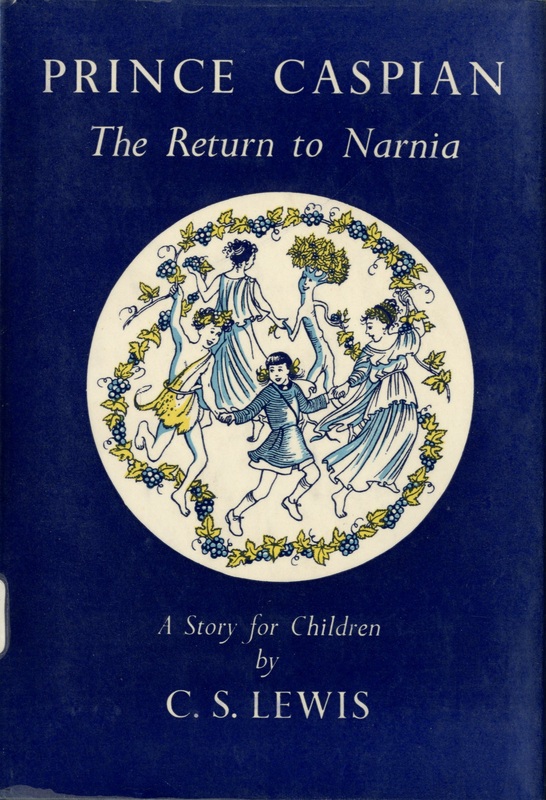 For the Chronicles of Narnia series, which would be one of Lewis’ biggest successes especially with children, his reading provides a way for children to recall war time and evacuation, and make sense of it all. John Bremer states in his brief biography of Lewis, “The frightening incidents in the book are not so frightening that children cannot enjoy them…” (54). Lewis’ Prince Caspian provides a reading that both appropriates war and evacuation. It creates a fantastical realm where children feel powerful and can deal with any situation they are put in. 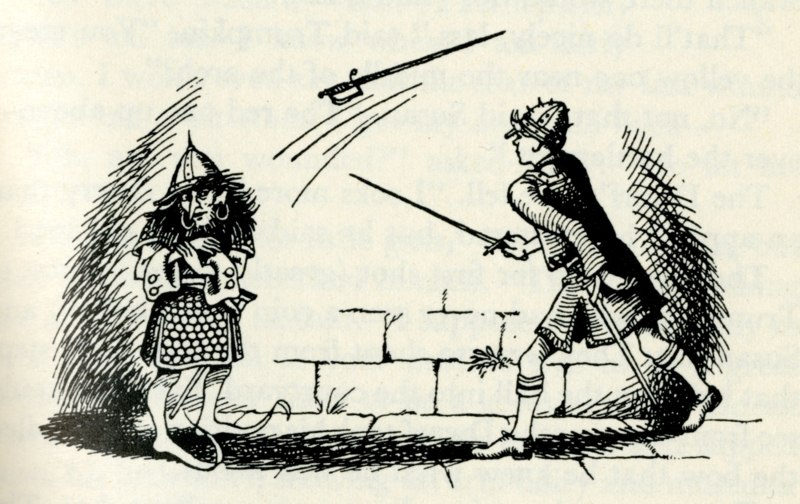 For Lewis’ initial 1951 readers, Prince Caspian brings up painful emotions and memories. However, through fantasy literature, Lewis creates a self identifiable and motivating story that helps children sort through feelings of helplessness and displacement. This particular copy of Prince Caspian was publish in 1966, twenty-one years after the end of the second world war. Why would Lewis’ Narnia series, and more specifically, Prince Caspian, remain such a popular book that it kept being reprinted? By this time, child evacuees would be in their twenties and thirties. These are adults who once read the book in the aftermath of the war, to escape their reality, and to make sense of why it happened and how to move forward. Perhaps, the continued success of this book is in its ability to continually appropriate the war for children. Parents, who experienced the war, might teach their children about what it was like to be evacuated by giving their children Prince Caspian. Through this, they share from generation to generation the hope and the strength that escaping to another realm gives. As Ford states, good stories can make one think twice about a concrete idea (13). The war was a bleak time; for children, feelings of abandonment and helplessness were common. Lewis gave his readers a place to explain why bad things happen, an escape to deal with those bad things, and hope that even the most helpless people can make big differences. “Escapism.” Compact Oxford Dictionary and Thesaurus. 3rd ed. Oxford: Oxford UP, 2009. Print. 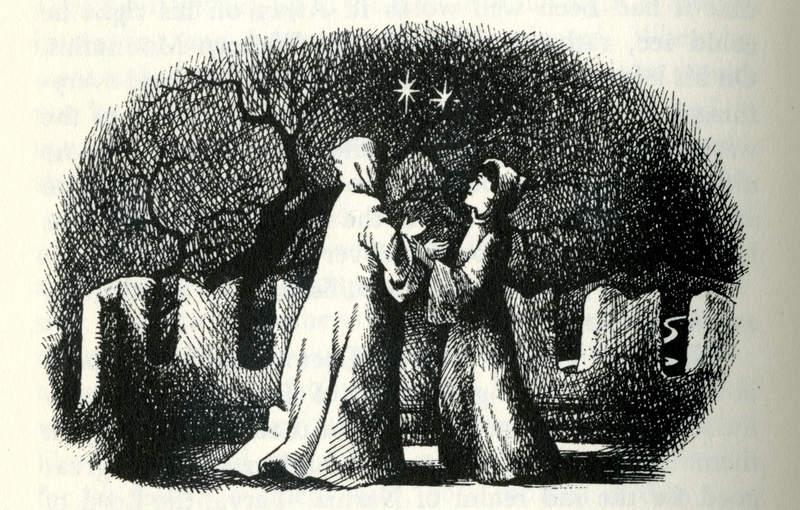 Ford, Paul F. Companion to Narnia: A complete Guide to the Magical World of C.S. Lewis’ The Chronicles of Narnia. San Francisco: HarperSanFrancisco, 2005. Print. Glover, Donald E. “The Chronicles of Narnia, 1950-1956: An Introduction .” C.S. Lewis’s The Chronicles of Narnia. Ed. Harold Bloom. New York: Chelsea House Publishers, 2006. Print. Jackson, Carlton. Who Will take our Children? : The British Evacuation Program of World War II. Rev. Ed. Jefferson, N.C: McFarland, 2008. Print. Lewis, C.S. Prince Caspian: The Return to Narnia. Illustrated by Pauline Baynes. 1st ed. London: Geoffrey Bles, 1951. Print. Lyons, Michael J. “The Road to War.” World War II A Short History. 5th ed. Boston: Prentice Hall, 2010. Print. Wright, Edmund. “World War II.” A Dictionary of World History. Oxford; New York: Oxford University Press, 2006. Open WorldCat. Web. 11 Feb. 2014.